In 1999, CPA Nancy Goodfellow and her family were dining at the Roadhouse Grill in Kendall when Nancy’s hand went through a hole in her booth. The damaged booth tore the main ligament in her hand, requiring multiple surgeries to repair. Miami injury attorney John H. (Jack) Hickey and his legal team recovered a $1.7 million jury verdict on behalf of Ms. Goodfellow for her medical expenses and pain and suffering. 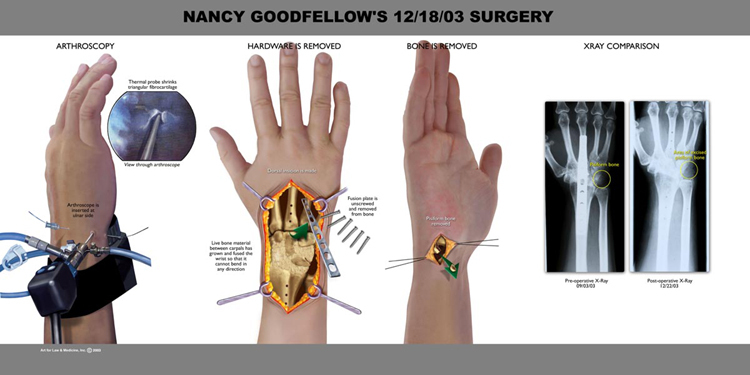 This image is a diagram of Ms. Goodfellow’s surgeries. For more information about the Goodfellow case against the Roadhouse grill and how the Grill destroyed evidence, read this article. If you have suffered an injury because of the negligence of a restaurant or any other business or individual, contact our Miami injury lawyers today for a free consultation.